(Nanowerk News) The U.S. Department of Energy’s Lawrence Berkeley National Laboratory and the SLAC National Accelerator Laboratory are collaborating to help define the most critical new technologies for the next generation of free electron lasers (FELs). In response to their joint proposal, DOE’s Office of Basic Energy Sciences (BES) has made a $1.8 million grant to Berkeley Lab and a similar grant to SLAC, as part of a newly funded national program in detector and accelerator research and development. Free electron lasers are revolutionary new light sources for scientific investigation. They have already demonstrated their strengths in facilities like the infrared FEL at DOE’s Jefferson Lab in Virginia and Germany’s FLASH, the Free Electron Laser in Hamburg, which produces “soft” (longer wavelength) x-rays. Other FELs have recently come online or soon will, including SLAC’s LCLS, the Linac Coherent Light Source, which will reach into the hard x-ray domain. For many kinds of science, including understanding rapid chemical reactions and complex materials on the scale of individual atoms and molecules, the preferred light sources of the future will be FELs that can produce tightly focused pulses of ultrabright soft x-rays at very high repetition rates. “Our goal is to develop and clearly articulate the unique scientific applications for these new kinds of light sources, and to define what’s needed to achieve them,” says John Corlett of Berkeley Lab’s Accelerator and Fusion Research Division (AFRD), who is coordinating the research effort. A free electron laser sends bunches of electrons through an undulator, a string of magnets arranged with alternating fields that push the electrons back and forth in phase with the wavelength of light they are emitting; the resulting intense beam of light is coherent and laser-like. Whenever an electron is accelerated – whether it’s just bouncing around in an incandescent bulb’s hot filament or being steered by magnetic fields – it radiates light. Free electron lasers emit superbright beams of x-ray light, first by accelerating bunches of electrons in a linear accelerator (linac), then by sending them through strings of alternating magnets called undulators; as the fast-moving bunches of electrons slalom back and forth, they emit photons in the direction of the beam. The back-and-forth motion is in phase with the wavelength of the light, so the light is coherent – like laser light – and quickly builds to high intensity. Today’s front-line x-ray FELs operate at repetition rates of ten to a hundred-plus electron bunches per second, a slow rate limited by electron-source technology and the fact that most FEL linacs operate in pulsed mode. At best, “warm” accelerators (as opposed to linacs whose superconducting accelerator cavities are refrigerated with liquid helium) may be able to accelerate discrete trains of bunches, each no longer than the accelerating pulse itself. But the FELs of the future will operate with electron bunches at rates of a million or more equally spaced bunches per second, using superconducting linacs operating in continuous-wave mode. Key to this high repetition rate is the electron injector. Producing superbright, ultrafast x-rays starts with a high-quality electron beam – and producing a bright, high-quality beam begins with the injector. The requirements are stiff – a million highly charged bunches of electrons per second of variable length leaving the injector at an energy of half a million electron volts or more – and forming such a tight beam that emittance (dispersal) is contained to within a micron (less than a few millionths of a meter-radian). While many of these and other requirements can be met individually by existing technologies, none yet can meet all of them simultaneously. Berkeley Lab’s Accelerator and Fusion Research Division, working with the Advanced Light Source (ALS) and Engineering Divisions, is working on an injector that can. With the aid of the BES grant, the Lab will complete and test a prototype of this most vital component of future FELs. An electron gun can be as simple as a hot cathode from which free electrons are boiled off and accelerated in an electric field, like those found in the cathode ray tubes (CRTs) of old-fashioned TV sets or computer monitors. The accelerating field is produced by direct current (DC), but while DC guns have attractive features, they break down at high voltages. 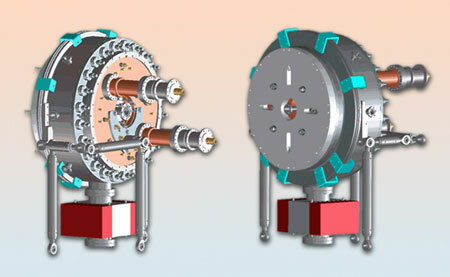 The VHF electron gun is a high-vacuum, water-cooled cavity roughly a meter in diameter. Radio-frequency couplers enter from the rear (left), where the photocathode is loaded into the center of the cavity. The beam exit port is at the center of the front of the gun (right). Berkeley Lab’s gun starts with a different technology, a photoemission cathode: instead of boiling electrons off the cathode with heat, the electrons are driven out by photons from a laser beam. The development of the photocathode is led by Howard Padmore, Experimental Systems Group Leader at the ALS. Its composition is crucial: the material must yield a high ratio of electrons to photons, with small emittance, and at the same time hold up under continuous use at hitherto unprecedented repetition rates – in high vacuum and a high accelerating field to boot. A variety of cathode materials will be tested for the new injector. “We decided on a somewhat unusual approach to accelerate the electrons,” says Corlett, namely that the gun’s radio frequency (RF) cavity operates at 200 megahertz (200 million cycles per second). In electrical terms this is “very high frequency,” VHF, but in fact the frequency is very low compared to most pulsed RF accelerators; Germany’s XFEL, now under construction, will operate with 1.3 gigahertz RF accelerating cavities (1.3 billion cycles per second), and SLAC’s LCLS at 3 gigahertz. The development of the Berkeley Lab accelerating cavity is led by Fernando Sannibale of AFRD’s ALS Accelerator Physics Group. The copper cavity is approximately a meter in diameter; thus the power density on the large-area walls is low, the heat load is low, and the cavity is easy to cool with circulating water even when continuously powered. Despite its size, a ring of 24 separate vacuum pumps keeps the vacuum inside the accelerating cavity ultrahigh, at mere trillionths of atmospheric pressure. Since the electron gun and the linac itself operate in continuous-wave mode, how is the very high repetition rate of short electron bunches made possible? Corlett adds, “A separate laser system controls the radio frequency systems as well, and synchronizes other lasers farther down the linac and at the experimental stations. In fact, a laser-based system synchronizes everything.” Timing and synchronizing lasers with kilometers-long, near-speed-of-light particle accelerators is a particular strength of AFRD under John Byrd and his colleagues. The VHF gun is already under construction in Berkeley Lab’s engineering shops, with initial financing from Laboratory Directed Research and Development funds. When completed in early January 2010, it will be installed in the Advanced Photoinjector Experiment (APEX) hall at the ALS’s Beam Test Facility. The process is expected to take up to three years. The additional funding from DOE’s Office of Basic Energy Sciences chiefly comes into play as components, including diagnostics to measure the electron beam and an accelerating module to boost the beam to energies of 30 to 40 MeV (million electron volts), are added to complete the injector. The outcome of the Berkeley Lab initiative in injector design is expected to define the technical performance of one of the most essential components of the U.S. Department of Energy’s new generation of high-performance light sources.